About us - Powermec | Rätt kompetens - Rätt produkt - Rätt pris! Our head office with warehouse is located 20 km north of Stockholm and 10 km from the main Swedish airport Arlanda. 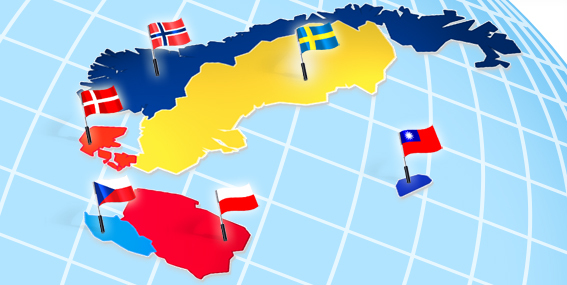 We also have office with warehouse in Norway, Denmark, Poland and Check republic. The market in Finland is covered by a strong local distributor. customer an excellent flexibility in each project. We can also visit any factory with very short notice if required. shipments and excellent logistical arrangements direct from our factory to your factory. Powermec has, since founded in 2003, had a fantastic business growth with an average of 37% per year. successful and appreciated by our customers. customer seldom receives the technical support or in-design our company offers. With growing trust and respect we receive more and more inquiries for new products and services from our customers. Thanks to long time experience from the market we have what it takes to help our customer optimize their end product. We can either reduce the cost and keep the quality or increase the quality at the same cost. We are fortunate to know and co-operation very close with the very best manufacturers in each product category! They are leading the development of new products, certificates, market and environmental demands. Since November 2015 Powermec is part of the Addtech group.